Let me say that even though my impetus for buying this dress was to have something to match my boots, I really, really love this particular boho style dress. It's definitely something that's out of the realm of what I normally wear, but it's always fun to step out of your comfort zone. For under $20, which is what the dress costs, it's fun to take a fashion risk and try something new! 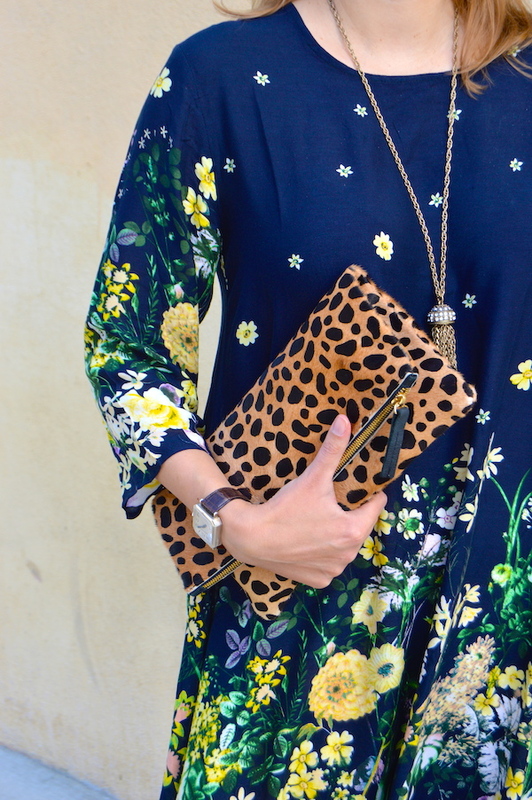 Plus, I love the floral print of this dress too and it will look great with tights and maybe a denim jacket once the weather cools off a bit. It's one of those things that you can just throw on with a cute necklace and pair of boots and you're instantly chic! A few thing about these boots: first they were only $36, so just like the dress, they were a great deal! Second, they enabled me to have what teachers like to refer as a "teachable moment" with the sales associate about different types of materials. When I went to check out, the sales associate asked me if the boots were suede or velvet. I said that they were velvet and tried to explain the differences between the two materials. She then said that she wasn't sure she would want to wear velvet shoes because she might get dog hair all over them. That's definitely I concern that I have too, although it turned out that dog slobber was a bigger issue, as William walked right up to them and pressed his nose directly against them! Waoo such a gorgeous dress & boots are such a great combo...! lovely pictures dear. That dress is so gorgeous! Love the print. The booties are fabulous too! Yes please!! Love this! Your dress is beautiful and those blue velvet booties are amazing! Love the blue velvet booties. So something I would wear everyday!